I’ve always had a thing about arriving at an airfield before a summer’s flying day begins. For me (and I accept it may just be me), there is often a calmness, a stillness, in the air before the airfield awakes and the business of the day begins. There is also the anticipation of the day to come, adventures and achievements waiting to be experienced, memories to be made and challenges taken up. So it is that I find myself on a rather overcast August morning wandering around Dunstable airfield, home to the London Gliding Club. I’m here at the invitation of the Air League to learn more about one of their gliding scholarship schemes, this one in particular aimed at getting youngsters into the air who might otherwise have never considered getting involved in aviation. Only thing is, where to find them? In my experience (not least as a father of teenagers), a group of 16-17 year olds is normally pretty good at making its presence known, but all is quiet around the club offices and in the hangar. I’m still puzzling this conundrum when a waft of cooked breakfast catches my nostrils. Of course – it’s the food. Follow the food. I’m still puzzling this conundrum when a waft of cooked breakfast catches my nostrils. Of course – it’s the food. Follow the food. Upstairs in the LGC cafe overlooking the airfield, breakfast service is in full swing and I grab myself a welcome cup of tea. Club members and staff are getting ready for the flying day, although the low overcast means that there is no great urgency to get out on the airfield just yet. And the Air League scholars are here too, tucking into breakfast and playing cards amongst the time-honoured interior decoration scheme of flying clubs the world over – bookshelves packed with flying books, tables piled high with old aviation magazines, pictures of aircraft and pilots adorning the walls. Outside the windows there is a fine panorama across the airfield, the parked aircraft and trailers, and the Dunstable ridge rising steeply 300 feet above the southern boundary of the landing area. Now seems a good time to re-cap the scholar’s journey to get here. The Air League scheme, generously sponsored by Boeing, invites applications each year from selected inner city schools in the London area. The schools themselves are involved in promoting the scheme and making an initial selection of promising candidates from those who apply. This leads to a ‘taster’ day at which around 60 applicants from 3 schools spend a day at the gliding club to get a flight and see how they get on around flying operations. From this group, 30 of the most promising applicants are invited to British Airways HQ at Waterside, where they are led through group exercises, interviews and an aviation quiz. Scoring is biased to EASA pilot competencies with a behavioural-based assessment. What the assessors are looking for is those most highly motivated and interested, and in particular those individuals who they think will gain the most from the opportunities the scheme offers. One of the interviewers (a professional aviation recruiter) told me that selection is as much about attitude as aptitude. This scheme is about enabling those involved to reach their full potential. Once selected, the nine successful applicants commit to attending Dunstable as a group for a two week course during the summer holidays. They live on site in dormitory accommodation provided by LGC and, weather permitting, they fly every day. But, as I am to find out, they do much more than just flying. The good news is that the weather is starting to brighten, and so it’s time to take the gliders out to the launch point. It is often a surprise to those steeped in powered flying that gliding really is a team sport, for the simple reason that without the willing assistance of a group of volunteers, the gliders aren’t going to make it out of the hangar, let alone get airborne. So it is that with minimal supervision from their instructors, the Air League scholars are soon towing the gliders out to the launch point, three to each glider (one to drive the tug, one to hold the wing and one by the cockpit in case a sudden stop or cable release is needed). In a reasonably short space of time the gliders are assembled on the airfield, next to the control caravan, and so the flying business of the day can begin. Once again, the operation required to get an unpowered glider airborne is very much a team effort. 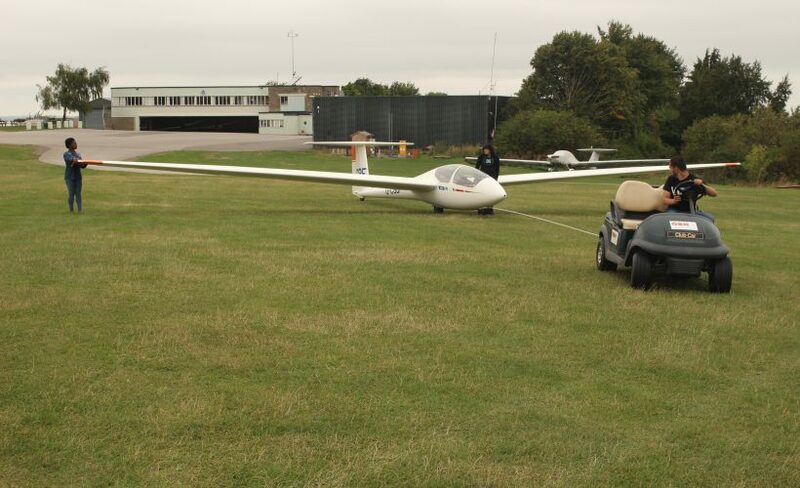 Each glider needs to be towed into position at the start of the take-off run and, once the pilots are ready, the cable is attached and the ‘wing runner’ holds the wings level and gives the ‘take up slack’ signal. This signal is seen by the person manning the launch point caravan and relayed to the winch driver who starts slowly taking in the cable. As the cable comes taut the wing holder gives the ‘all out’ signal and again this is relayed to the winch driver. To those used to a power aircraft take-off, things move pretty quickly from this point. The winch driver increases the pulley speed and the cable pulling in accelerates the glider so quickly than after just a few metres the wing runner is left behind and releases the wing. The glider is airborne just a couple of seconds later and after a brief shallow ‘safety climb’, the glider rotates into a 45 degree nose-up attitude and quickly climbs to a point which today is around 1200 to 1400 feet directly above the winch. From ‘take up slack’, to cable release at the top of the launch, takes less than a minute. No, it’s nothing like your average Cessna or Piper take-off. Meantime, back at the launch point, the next glider is being pulled forward. And the important point is that with the exception of the all-important winch driver, the launch operation is manned and controlled by the scholars themselves. At the beginning of their time at Dunstable they are given the necessary instruction and as soon as they are competent, they take the responsibility for this operation, right down to keeping the airfield log updated. At the other end of the flight, once a glider has landed the scholars will head out with one of the buggies to tow the aircraft back to the launch point. To keep this operation flowing smoothly requires diligence and attention to detail; like any safety-related operation in aviation there are traps to catch-out the unwary or inattentive and the scholars are entrusted with aircraft and equipment worth tens of thousands of pounds, not to mention the safety of the pilots and students in the gliders. It’s fair to say that in their time at Dunstable they will learn a lot more than just how to fly gliders. The scholars themselves seem very comfortable with this level of engagement and responsibility for the launch and retrieve operations and very safety-conscious of what is happening around the airfield. It’s certainly very good grounding for anyone who is going to spend any time around an operational airfield. One of the many things I like about gliding is that it can be a surprisingly civilized affair. It has become evident that the cloud base is not breaking and lifting as quickly as forecast, so the decision is taken to pause the flying and head back into the club for an early lunch. Back at the café, buffet-style food options are laid-out (and pretty good they are too), so I collect some food and invite myself to share a table with the scholars. They are now about two thirds of the way through their two week course and I want to know what they make of the course – and flying in general for that matter. I ask what is the best thing about their time at Dunstable and the reply comes back quickly – the food! They are full of praise for the catering, provided largely single-handed by a very organised cook (Trevor) and, on the evidence before me, I can see their point. The dormitory accommodation is also better than expected and living on the airfield seems to suit them well. In the evenings, the evening meal is the main event (no surprise there), then they socialise or take a walk around the pretty countryside that surrounds the gliding site. The conversation moves on to the flying itself and something I’ve been wondering about for some time; to newcomers, is flying actually cool? The answer is a resounding ‘yes’ – flying is, apparently, very cool. And it’s very easy to identify with the reply when I ask ‘what is the best thing about flying?’ ‘Making a good landing’ is the majority verdict. It’s also interesting to me that none of the trainees had harboured a burning desire to become a pilot before applying for the scholarships. The disturbing reality is that these bright and motivated youngsters considered aviation to be a ‘closed shop’, and not something that they had even thought of as a career choice before this gliding opportunity came along. Their short exposure to flying has changed that – at least two of the scholars told me that they were seriously considering changing their choice of education and potential career as a result of the course. One is looking into taking a degree in aeronautical engineering, another now wants to be an airline pilot. But even with that wish expressed, there is considerable uncertainty about how to ‘break into’ aviation from this point and none of those I spoke to were aware of some of the degree-affiliated programs out there, for example. They ask about my experiences and I can say that I got my start also from an Air League scholarship, in this case for a full PPL. When asked the potential cost of that, I do a quick sum in my head and guess at about £8-10K in today’s money. There are low whistles and a shaking of heads around the table – this is a serious amount of money and still a long way short of the money needed to get a commercial licence. ‘You were lucky’ they say: yes, I was. It happens that gliding is especially good at encouraging youngsters into the flying. 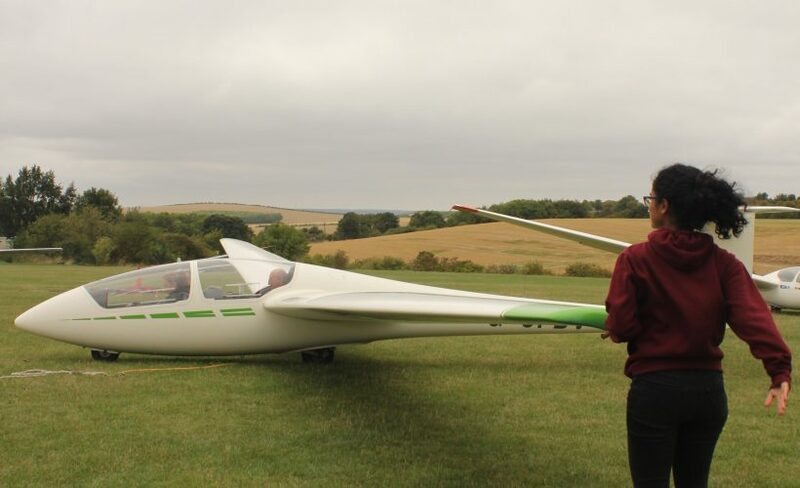 Like many gliding clubs LGC has a ‘junior gliding’ scheme where young people pay just £40 a year membership, get half-price launches and no flying fees. Anyone from the powered flying world who spends time at a glider club may well be struck by the number of youngsters flying – after-all you can solo a glider at just 14 years old. Nevertheless, for the scholars – all living in London – just the logistics of getting out to Dunstable to fly can be daunting when you don’t have easy access to a car. 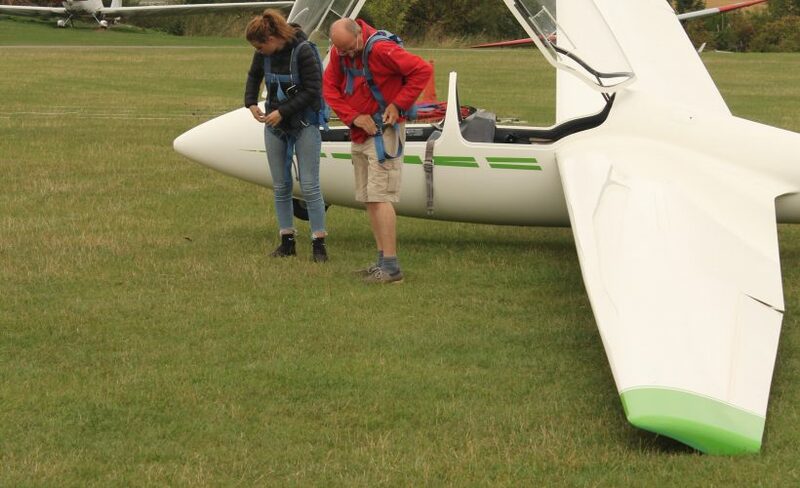 There are bright spots – one of last year’s scholars has returned to Dunstable this year to continue her gliding, and she is now working towards a career in aviation. Also, one of the club instructors I met earlier in the day flies airliner’s at nearby Luton, having started flying at Dunstable on a ‘junior’ scheme. The fact that he instructs at LGC in his spare time is a fine example of dedicated career pilots bringing their enthusiasm and experience back to ‘grass roots’ flying. Talking of flying, the weather is finally brightening and with lunch demolished it’s time to head back out to the launch point. Once there, I’m offered the chance to fly in one of the gliders – what pilot could resist an opportunity like that? So, soon after, I’m strapped into the front cockpit of an ASK-21 with Graham, one of the course instructors, drawing the short-straw as my minder for the flight. Graham is kind enough to let me fly the aero-tow and I do my best to keep some semblance of proper positioning as we climb to 2,500ft. Once we’ve released from the tow, I meander around the area north of the site, occasionally blundering into a thermal and trying to circle somewhere close to the core in order to establish a climb of some sort (or at least go down more slowly). Graham tells me that the three course instructors are all volunteers and mostly they come back year after year to do this. For the duration of the course they also stay on the airfield and generally each instructor flies with the same three students so they get to know each other well. I’ve certainly noticed a relaxed informal atmosphere between students and instructors. The students seem to appreciate the skill and experience of their instructors; the instructors want to see the students progress well. Although the obvious aim is to get the students solo by the end of the course, this is not a given whenthe weather and the vagaries of winch launching are taken into account. It also must be remembered that none of these youngsters have any previous flying experience, some of them have never even been airborne at all before applying for the scholarship. I venture the opinion to Graham that the scholars may be learning as much outside the cockpit as inside it. They seem be operating as close-knit team, looking out for each other and undoubtly they are well-mannered and quick on the uptake. I’ve also noticed that they don’t seem at all star-struck by the BBC TV crew who have turned up to film the day for a TV news item. In due course I run out of talent and then height, and Graham courageously lets me fly the sporting approach up to the ridge and onto the undulating landing area. And sure enough, as we climb out of the glider, a buggy is heading out from the launch point, with a couple of the scholars on board, to tow the glider back in. The main sponsors of the course are Boeing (although British Airways also sponsor a similar scheme) and this is the scheme’s sixth year, hence on this scheme alone 54 youngsters have been introduced to flying to solo standard. Boeing have sent a representative (Katie Condon) out to Dunstable to hand-out certificates (and some very nice Boeing mugs), and Philip Buttery, Director General of The Air League, has come to Dunstable to see the course in action. Teachers and mentors from the scholar’s schools have also journeyed-out for the day, and seem genuinely impressed by what the scholars are learning and achieving. We all head to the club hangar and words are said, certificates are handed-out and photographs are taken. In a few days the course will come to an end, the scholars will head back to their homes and the instructors will return to their normal routine. I can’t help but wonder if the scholars will come back to aviation in some form or another. There is no doubting their enthusiasm and attitude, but will the flying business prove to be too much of a closed shop – especially to those with flying ambitions but not necessarily the ready cash to finance their own way through professional flight training. On the drive home I’m pondering this conundrum further. There is absolutely no doubt that at just about all levels the aviation business has recruitment issues – from airlines desperate to recruit new entrants to the right-hand seat to flying clubs so short of instructors that they cannot operate at anything like full capacity; almost all levels of the flying business are in need of more incomers. And yet, with very few exceptions, the professional flying game requires newcomers to make a very serious up-front financial commitment in training as the price of entry into the club. For sure, the financial and job satisfaction rewards are very good for those who make it onto the professional flying ladder. But have the airlines become complacent, assuming that there will always be a steady flow of high quality self-sponsored applicants beating a path to their door whenever they need more flight crew? A few minutes on the internet tells me that the three largest airlines in the UK and Ireland have, between them, something like £10bn in cash and short-term investments. Of course, it is in the nature of an airline business that they tend to get their ticket money ‘up front’, sometimes months before the paid-for flight takes place, so it is not unusual for an airline to hold quite substantial amounts of cash and equivalents. But, does it take a huge imagination to see a fraction of that money being invested into developing the next generation of pilots? But, does it take a huge imagination to see a fraction of that money being invested into developing the next generation of pilots? After-all, the projections all point to an accelerating demand for pilots. If it’s tough to recruit quality new pilots now, what do the airlines think the situation will be five years from now, or ten? In my personal view, for too long the airlines have been fishing in a small pool of those recruits who not only have the attitude and aptitude to be a good pilot, but also have access to the funds needed to pay for their own training, to the extent of requiring them to pay upfront for type-rating costs even after they’ve got a licence. It seems a bit bizarre to me that many airlines are scrambling to poach pilots off each other with pay offers and other perks, rather than investing more modest (and recoverable) amounts in offering financial assistance to the vast majority of those who don’t happen to have ready access to the sort of investment currently required of a potential professional pilot. You see, I had thought I was going to Dunstable to report on a worthy charitable endeavour, Boeing and others spreading some corporate largess around and generally showing that they believe in social responsibility. I realise now, the truth is quite different. The money Boeing and others are putting forward to bring new people into flying is not a hand-out, it’s an investment in their own future. For too long aviation has been a closed shop; and locked cockpit doors, airport security and the high financial barriers to entry have only made that situation worse. Those of us already involved in aviation can tell each other all we like about what a wonderful business it is and how lucky anyone is to be allowed to join our club. But we really need to open the door to new talent, or we’ll end up in a shrinking business, not a growing one. Even weeks after my day out at Dunstable, I was still pondering over something Graham said to me whilst we were soaring over the Roman road that runs close by the LGC site, straight as an arrow, disappearing beyond the horizon. He told me that he had been airborne with one of the scholars on a particularly clear day, and he was able to point out the towers of Canary Wharf in the far distance. The scholar was stunned, he said he’d never seen such a distance in all his life. It seems to me the real lesson of the project is that if the aviation business is to continue thriving, we need just a few more aerospace companies and organisations with the same far-sightedness and clarity of vision.